Lack of clean water is one of the most important public health challenges in less developed communities. Due to insufficient financial and technical resources in places in need, development of low-cost water treatment technologies can play a key role in sustainable water provision. 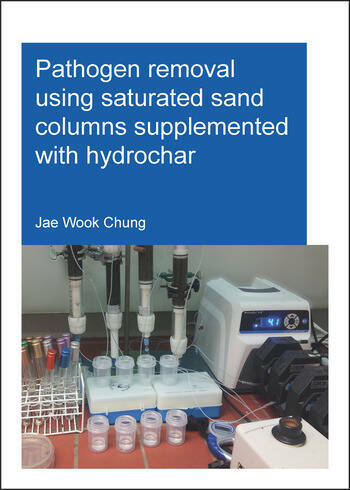 In this context, this PhD research investigated the removal of pathogenic microorganisms in simple sand filtration set-ups supplemented with low-cost adsorbents (hydrochar) produced via hydrothermal carbonization of biowastes. Two types of hydrochar, derived from hydrothermal carbonization of agricultural residue of maize and stabilized sewage sludge from wastewater treatment plant, were evaluated as adsorbents for Escherichia coli removal in saturated sand columns. The removal efficiency of sand columns amended with these adsorbents improved from 20-70% to ~90 % by alkali activation carried out in room temperatures using 1 M potassium hydroxide solution. This PhD research also demonstrates the removal of human pathogenic viruses in sand columns supplemented with hydrochar adsorbents derived from stabilized sewage sludge and fresh swine waste. In order to enumerate human pathogenic rotavirus and adenovirus in virus removal experiments, low-cost polymerase chain reaction assays were developed under this PhD study. These assays show a competent performance in analyzing virus concentrations in both laboratory and environmental samples. Amendment with either hydrochar (without alkali activation) in sand columns was able to remove more than 99% of both viruses. Jae Wook Chung was born on 16th June 1980 in Seoul, Republic of Korea. He did his undergraduate study in Environmental Engineering at Kyung-Hee University. In 2010, he obtained a Master of Science degree (with distinction) in Environmental Sanitation from Ghent University in Belgium. Then he started his PhD research at UNESCO-IHE and Wageningen University in The Netherlands. During this PhD research period he won the Green Talents Competition in 2013. His main research interest focuses on developing affordable water treatment and sanitation technologies for less developed communities such as rural places or slum areas in Third World countries.